This entry was posted in BGI - Black Grievance Industry, media bias, NFL, Occupy Type Moonbats, Political correctness/cultural marxism, President Trump, Professional Idiots, propaganda, Typical Prog Behavior, Uncategorized. Bookmark the permalink. The company who made logo wearing as if it was some sort of jewelry mad millions off of total idiots. Now they have undone the industry with one poor choice. If you are wearing logos you are free advertisement. You look the fool. Will they put him in a pink hat as well? Just looking at his face puts me off. I nominate this comment as the Best Comment of the Day. Agree 100% especially about free advertisement. I have asked my nieces and nephews how much the got paid to advertise for logo brands? Eyes glaze over. Not only have you paid out your nose for a crappy shirt, shorts, shoes but your paid their advertising costs. ASICS are great. I’ve been wearing them for a long time, and I have made my kids and my husband fans as well. My last Nike’s I wore thirteen years ago. I had blisters upon wearing them the first time for walking and running. Never again. Despite having used Nike Running Shoes for years, I’ve been using ASICS for both Running & Cross-Trainers for quite a while, and they work much better for me than NIKEs. Totally disappointed in Nike. They must be going after a certain colleg-age demographic. The Nike swoosh is hereby proclaimed the Swooshtika, a symbol of hate and of oppression of third world workers and cheap labor to overcharge the poor inner city youth in America and promote violence and crime That’s a hell of an evil business plan from this mutinational globalist company that JUST BLEW IT, by getting down in the dirt with multimillionaire Cappy.. Spread it far and wide — Nike’s Swooshtika is a symbol of hate. My kids and I don’t need Nike anymore ! I just watched this video and it was very moving. It’s about 7 years old, but I think that if the situations in Indonesia are different than at the time of the filming, that it is probably even worse, not better. Take the time, the 20 minutes, to watch it. The unbelievable poverty and absolute filth of the homes and villages of the Nike employees at the factory are gut-wrenching. I’ve never any Nikes… and I never will! GREAT video, thanks for posting this. Nike’s website has a “mapping” of their factories, which is just a listing of locations- just the numbers are available, though, no photos. Hundreds are still in Asia. You can email Nike’s CEO,Mark Parker, at mark.parker@nike.com. Actually, I forgot to mention, they probably like the one in the video — filthy, suffocating, sweat shops. No “social justice” for the Nike employees in their slave labor camps, huh? I doubt if Kaepernick will mind either as soon as he gets his big fat check from Nike. Thank you Guffman. Humans trafficking. I try to buy everything make in USA. Often the product is only “assemble” in US. Indonesia is mostly “ Muslims”. What an idiotic decision!! Another anti- American company right there! NO MORE Nike for this family EVER!! New Balance are made in the U.S.A! I love mine! I’m eager to see their stock tank today..And tomorrow. And the day after.. I used to buy Nike products (sneakers and such) but they have mixed politics with business. Never, will I purchase Nike again….ever! Can someone with a twitter account please tweet to the snowflake that in Chicago 302 blacks have been killed so far this year and only 4 involved police. And black women have, by far, the highest rate of killing their (likely black) unwanted inconvenient mistake babies. The threat isn’t coming from police, snowflake. Is there a word to describe self-genocide? A group of people is responsible for killing off their own people? Self destruction seems to fit nicely. The fact that 4 involved police is 100% irrelevant. Dont feed the narrative. Those 4 shootings were more than likely justified, in fact, they indicate the problem. That black youth in general have a problem with authority. Maybe its because over 70% of black children are born out of wedlock and 57% of them are raised in homes without a father? Maybe? Nike stock currently trading in the premarket session down from Friday’s close -$2.31 / 2.81%. Way to go Nike.. Go New Balance!! Defying the laws of economics is like defying the law of gravity. Eventually you break yourself on the rocks below. I am proud to say hat I have NEVER EVER bought a pair of Nike anything, clothes or otherwise, for myself, or others. I’d rather get much, much, more for my money and can do so at many places. Plus, I don’t need to buy cheap crap made in sweatshops and sold at ridiculous prices. I’m not that stupid. I don’t make deals with the devil. Where can you find Nike sweatshops? Where is the headquarters of this U.S. born company? Why did they sue Beaverton, OR? Nike should be IMMEDIATELY EXPOSED for their GLOBALIST interests. They support communism and socialism, it is no stretch that they would HATE Our American Flag, Our Patriotism, Our America First President and Policies, and want to spread the lies that America is bad, like our last President, The Kenyan. This is how globalist countries and companies interfere with our elections and destroy our culture and way of life. This kind of interference should be outlawed. We need to ask the NFL if their gear is MADE IN THE USA!! And any other American sports team who uses Nike products. This sounds like a well-hatched plan between the NO FANS LEFT and NIKE. NIKE sells to collegiate and other schools as well. We need to shut that BUSINESS down unless it is MADE IN THE USA! EXCEPT 127 of those classified as USA Workers are MIGRANTS. This is not the only time Nike has chosen a less-than-moral person to represent their company. They have a long list of cheaters, beaters and dopers on their payroll. Why wouldn’t they add an attention-seeking SJW? Oh – at first when I loaded the page your image was an error; now they’re both up. 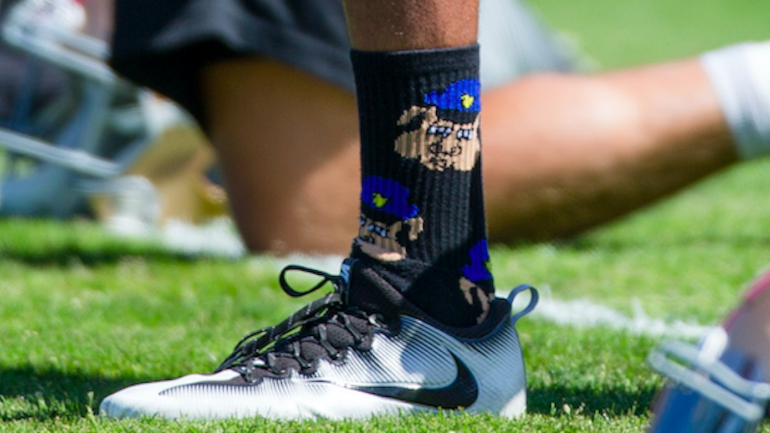 How are these socks considered any less offensive than, say, socks depicting Obama as a monkey or something else equally racist, stupid, and hateful. I wonder who at Nike decided it was a good idea to consumers in their biggest market, “F**k you”. In point of fact, Colin Kaepernick didn’t sacrifice anything, really. He was a has been/never was who demanded too much money to be a backup quarterback. He had been a terminal bench warmer when he decided to walk out on his contract to be a free agent which didn’t work out. When you’re a marginal talent you can’t afford to be a toxic personality. 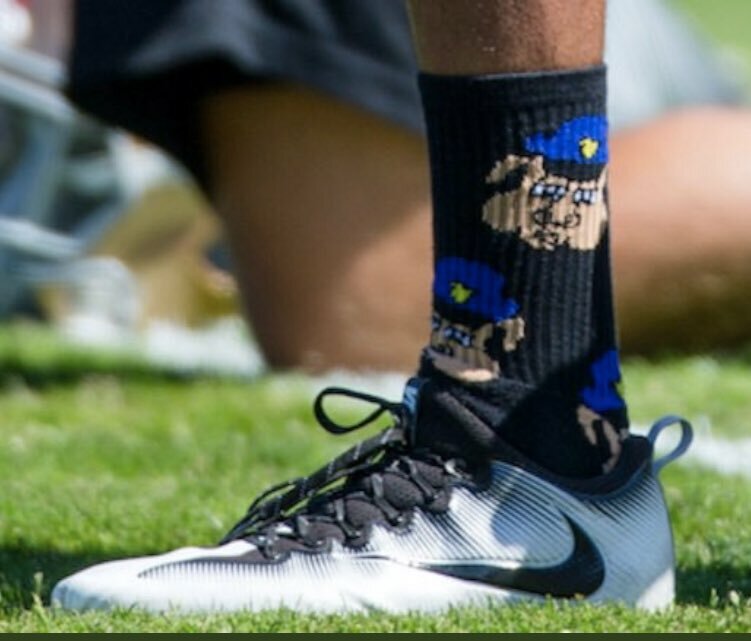 Unless Nike is calculating they’ll pick up enough SJW customers to offset the loss of patriotic Americans who aren’t racist cop haters. That is not going to work out well for Nike – only way it could work out is if the gubmint bought gubmint shoes to give out with the gubmint cheese…. Kap sued the NFL. John Elway was asked about the lawsuit. What he replied was that he testified at his deposition the Broncos offered Kap a contract to qb the Broncos. Kap rejected it. The Broncos moved on. [The Broncos didn’t have the cap room to offer Kap what Kap thought he was worth.] Nike, if you mistreat Kap, he will sue you. 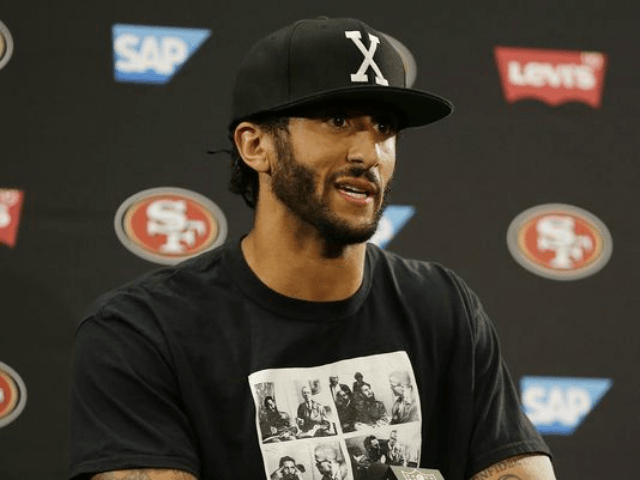 That’s Kap’s social justice stance–it’s all about him. Good luck with that social justice program you support. It’s already moving your stock prices downward, and we’ve only just started. The Nike folks didn’t pick Colin pickledick for his “sacrifice” or athleticism. They picked him because he is the most notable anti-President Trump sports rep out there. These sorry sumbishes created a mediocre product for Americans in a free market Capitalism country, and almost immediately moved operations and manufacturing overseas to exploit cheap labor and skirt tax laws and avoid the stringent regulations they so valiantly defend, polluting their asses off in Asian sweat shops. Two faced hypocrites. I had the good fortune to try on a pair of Nike shoes, early on a long time ago. THEY SUCKED and did not fit. Never bought any of their crap. A radio host just asked why, if Nike wanted to go with a “woke” spokesman, they didn’t pick LeBron James. At least LeBron James is still getting paid to be a professional athlete. I imagine Nike dosn’t like the tariffs. Phil Knight conceived and built Nike on overseas labor. They are building a facility next to the world headquarters (WHQ) in Beaverton that (as I have been told) will do limited manufacturing with robots. So Nike would obviously be happy to go back to Obama. Outsourcing overseas … you reminded me of something that happened to me. I worked for a company that did contract manufacturing and also brokered a lot of production overseas: We made mostly small parts and wire harness assemblies. Anyhow, after I left there I had a lot of contacts in China in metal fabrication, electronics, and injection molding. It occurred to me that with my knowledge I was perfectly situated to go start my own company doing exactly the same thing my old boss had been doing: Acting as the middle man matching up Chinese manufacturers and American businesses. I went as far as registering a web domain but then stopped. I just couldn’t do it; even though it might have made me rich I didn’t want to be part of pouring money into the Chinese economy and pushing Americans out of work. So I didn’t move ahead with it. One decision I’ll never regret. I appreciate and applaud your decision. It must have been tough to turn down the opportunity to make a lot of money. I am an Almost-end user of a lot of those parts you mention your involvement with. Overall, I figure I have a 50-50 chance of receiving a workable or non-defective part; If the part has to do with proper and correct metallurgy and finish( i.e., brake rotors), fuggediboudit. Junk metal sold new at discard-at specifications. And I eagerly await a return to MADE IN AMERICA being on more than just the packaging some of that junk comes in. You are quite the Patriot, my friend. I agree with a lot of this, except: Overall, Nike shoes are great quality, and a great value. For everyday casual wear, there are many options out there. Wear what is comfortable and has the looks and style you want. I mostly wear my running “trainers” that have been retired. But for sports use, Nike covers the range more than any other shoe brand. It was strange to see them attempt to get into the soccer market big time, over decades – the Nike brand used to mean you did not know what you were buying, like you were clueless; everyone had adidas, diadora, etc. Like MS internet Explorer, they hung in there and won market share, and got established as yet another good soccer shoe. WEll enough to have some that are quite good, in many ways, with a very high price tag. No one is paying $200 for soccer cleats in order to look good at the mall or high school. They have top products in running, tennis, b-ball, and cross-trainers. Hiking stuff has been fair – some “ACG” stuff has been good, but that is a very tough specialty market. A t-shirt is a t-shirt. But their sport shirts, running shorts, and exercise tights have been great. Good fit, good workmanship holding up to wash after wash. As much as anything else. I would say over-priced, but so are items from the other name brands. Any athletic shoe is made on a “last.” A last is the shoe form around which the shoe is built/designed. If you make a shoe around one last, it is like opportunity-cost – you cannot make it around another last. All shoe companies commit to a last. Even if you offer different widths, you still have a general foot-form that must be chosen. If you find a shoe company whose shoes fit you well because their last matches you, you are doing good. I can put on most any Nike, in my size, and do great. But our feet differ. if Nike shoes do not suit your foot, it is not them being lousy; it just means they went with a last that does not favor you, but does favor other people. Above all of that, Nike tried to accommodate a range of foot types for years by having those arch inserts you could stick in under the insole. What other shoe company was doing that? Which are doing that now? Now, no one puts a good insole in their shoe. Those who are actually using shoes for athletics know this, and we go buy a high quality after-market insole, like a Spenco. When you go to buy a great performance bicycle, they don’t have pedals. Why not? Because you are going to put your preferred pedal on there. So, I think it makes anyone look dumb to say that Nike products are lousy. They are not. Up until now, Nike has played the game well. Good products, with good outsourced low labor and good quality control overseas, and good marketing. To me, Target was similar: a great “business model,” overall, and suited me very well, until they went all SJW. Are you a copywriter for Nike’s PR firm, The Last Democrat? LOL! Nike,will loose millions,what a stupid is is stupid does! It’s a anti-American company! I guess rodge r goodell will be the only dude to buy Nike . Slave wage labor and profit margins likely higher than Apple’s. When Phil was on Bloomberg recently he said Nike was coming onshore to take advantage of American automation; there would be little or no job creation. Better than nothing. At least there’d be jobs associated with operating and maintaining the automation whereas there’d be nothing if they were made overseas. Americans burning their Nike gear and posting the vids just like with the NFL fiasco. Who would’ve guessed? I’m all in favor of Kaepernick taking a knee …as long as he takes it hard right in the groin. Oh, wow – turns out Krapperdick isn’t just the spokesman he’s going to have his own line of signature Nike merchandise that will pay him royalties. Do you suppose he hired Megyn Kelly’s agent? I’m pretty sure Nike will soon regret this like NBC regrets their Kelly hire. not from Nike, the maker of the Swooshtika, a hate symbol for the oppression of workers in thiird world countries and the overcharging of targeted groups with an enslaved mentality,who, despite being born in the First World, will fight, steal and kill for the new gangsta symbol. Nike has become an anti-American company that produces virtually nothing in the USA except lies and division. Nike can take its Swooshtika and shove it where the sun don’t shine. Nike???? ?Just don’t buy them,just do it say no to nike!!!! !We just did it no more Nike!! Their stock will tank to 5 dollars a share! I also find it interesting how Nike really hasn’t addressed how their shoes and clothing lead to violence in the black community with people getting shot over Jordans and other shoes, but they put out this lazy act of marketing and people thinking they should get the NCAAP Vanguard award. It’s amazing how people’s views are shaped by media narrative. Nike said nothing and two years after it was more politically viable for them to do so they pounce. I wished people would realize most of these corporations coming out with SJW marketing agendas aren’t doing this for benevolent reasons…..it’s just business. Nike knew this would happen. It’s not like they will be shocked by the drop in stock or sales. There must be a reason they do it. I’t would be interesting to see who was prepped for this and made money on the stock dropping. It would be a good trick. Get a controlling interest in the board, have your surrogates short the stock over a lengthy period of time so as not to cause any red flags and when ready, influence the board to do something that you know will cause an immediate drop in the stock. Make your billions and walk away laughing as you watch the company burn to the ground. I just can’t believe this is just a “dumb move” by the board. Too many examples not to anticipate the consequences. There has to be a profit-motive of some kind behind this. Bad move Nike, typical SJW isn’t a “heavy user” of athletic apparel … unless you’re planning a new line of muumuus. Old Gino must have completely missed the part where Kaepernick emptied an entire new stadium here in the Bay Area- in fact the owner was giving away tickets and there were no takers- that’s bad. But you gotta make a stand when you gotta make a stand…..even in his home town, which is not that far from mine, they find him repugnant…and his parents who stand by him (gotta admire that) are ostracized by the community. Kaepernick has damaged a lot of people…..all for a girl. The fact that he can not even articulate what he finds so unjust says it all. Nike you are cooked! You just don’t know it yet! Sorry if this point already made — but what this tell me is that the “business community” wing of the Resistance is going all-in on the same expensively curated and cartoonishly bad advice from the same Tesla-driving CA/NY/DC “consultants” who raked in unold gazillions for ensuring their clients would lose in 2016. Good luck with that. Great twitter thread byTheLastRefuge @TheLastRefuge2. So I do wonder if Nike knows it should be pegged as pro-Communist China/pro-North Korea. Does supporting a professional athlete who is suing his employer for collusion, kneels at the national anthem & rejects employment opportunities that don’t meet his salary requirements or accommodate his humongous ego make him a worthy ad subject? Dear Nike: You cannot make chicken salad out of chicken S**T!! And you just can’t fix STUPID!! I sincerely hope you lose billions & people stop buying your logo’d shoes & clothing. If we’d known earlier that you work with North Korea, in defiance of US sanctions on that country, you might not have had enough money to pay Kap to be your new spokesperson. Bad move, Nike….